Lisa M. Stasse was born on a farm in a small town in upstate New York. Bitten by the travel bug, she has since lived in twelve different states and four different countries. 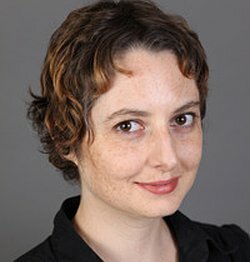 She graduated from Cornell University with a degree in Political Science and English literature, and is currently a digital librarian at UCLA. Lisa loves watching science fiction movies, cooking Spanish food, and dancing around her house to 80’s music (when no one is watching). She lives in Santa Monica, California with her husband and their two-year-old daughter. All three of them are learning how to surf. Thanks so much for stopping by Literary Cravings, If you could sum up The Forsaken in four words, what would they be? It all started with a nightmare I had. I was being chased by figures in black robes on a harsh tropical prison island. So I guess the novel began with that premise. But of course the characters made the whole story worthwhile. They felt like they came alive when I was writing. Alenna’s perseverance, and her journey to discover her own strength (and to uncover secrets about her own identity), is one of the main aspects of the novel. Did you do any unique research for The Forsaken? Most of it came from my own demented imagination, but I did read a bunch of stuff online about prisons and islands, as well as totalitarian governments and their mind control experiments. The easiest character was Gadya because (my friends tell me) she’s a lot like me. Really impulsive and sort of outspoken, even if she doesn’t mean to be. I don’t have her tattoos or dyed hair, though! The hardest was David, who is a very elusive, mysterious guy. He’s not Alenna’s main love interest, but he’s definitely on her radar. Almost all the characters were fun to come up with. I tend to fall in love with all of them. I’d love to write a great thriller/mystery one day. Something really edgy and unique. Maybe a story about a college-age girl who goes undercover in some dangerous subculture for some reason. I love movies like Eastern Promises and Drugstore Cowboy (an old movie from the 80’s, but it’s awesome–about undercover cops). I always figured that writing a mystery would be a lot of fun. 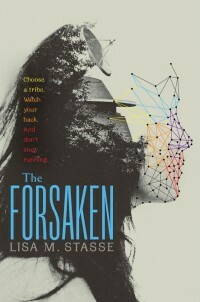 That’s all for Lisa, readers be sure to pick up The Forsaken out now!! !